NEW YORK Confidence among U.S. homebuilders fell this month because of concerns that increased demand for new homes is exceeding supplies of ready-to-build land, building materials and workers. In the short term, those constraints could slow sales. But builders' outlook for sales over the next six months has reached its strongest point in more than six years. The National Association of Home Builders/Wells Fargo (WFC) builder sentiment index released Monday fell to 44 from 46 in February. It was the second decline since January, which was preceded by eight straight monthly gains. A measure of current sales conditions declined from February's reading. Readings below 50 suggest negative sentiment about the housing market. The last time the index was at 50 or higher was in April 2006. The index began trending higher in October 2011, when it was 17. That increase coincided with the start of a housing recovery. An improving job market, persistently low mortgage rates and rising home values have helped fuel U.S. homes over the past year. New-home sales jumped 16 percent in January to the highest level since July 2008. The combination of heightened demand and a tight supply of previously occupied homes for sale have motivated builders to ramp up construction. Builders started work on the most homes last year since 2008. Despite the positive sales trends, many builders are facing higher costs for building materials and competition for land cleared for development. Some also are having trouble obtaining financing to buy land and cover construction costs. 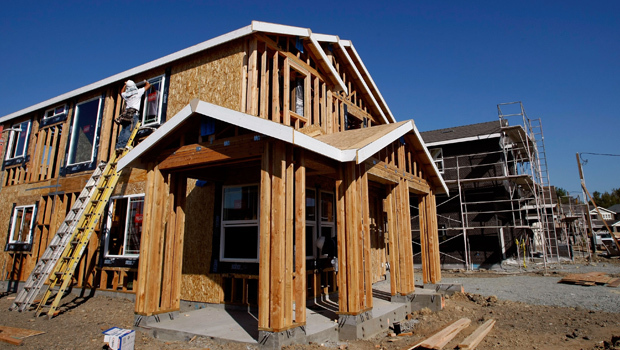 Meanwhile, builders large and small have reported a shortage of workers in markets where residential construction has picked up sharply, such as Texas and Arizona. Many construction workers - from roofers and drywall installers, to framers and carpenters - appear to have fled to other fields, such as the booming oil and natural gas industry. While U.S. residential construction jobs increased 3.1 percent in February from a year earlier, they remain about 40 percent below the peak reached during the housing boom. "The road to a housing recovery will be a bumpy one until these issues are addressed, but in the meantime, builders are much more optimistic today than they were at this time last year," said David Crowe, the NAHB's chief economist. The latest builder confidence index, based on responses from 341 builders, comes as the critical spring home-selling season is under way. A gauge of current sales conditions fell four points to 47, but a measure of traffic by prospective buyers improved three points to 35, while builders' outlook for sales in the next six months improved one point to 51, the highest level since June 2006.